AMAZING, addicting, can’t stop won’t stop Strawberry Cheesecake No-Bake Energy Bites that are loaded with protein, creamy cashew butter, sweet strawberries, and so many good things. These are perfect as a snack or healthy dessert when you’re craving something a little bit sweet! Happy Monday, friends! How’s your week going so far? Cody and I had another baby appointment on Friday and we were able to see our little guy happily moving! He’s been growing so much, y’all. Thankfully, I’m now feeling MUCH better than I was during the first trimester and have hit the point where I’m starting to crave all the things. During the first trimester I pretty much couldn’t stand anything sweet, but now I’m like I NEED DIS. 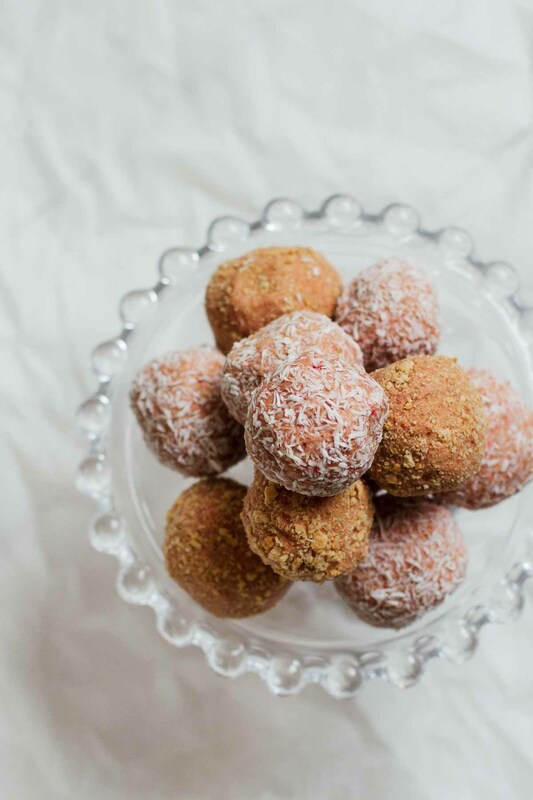 And let me just say, these Strawberry Cheesecake No-Bake Energy Bites are hitting the spot! They’re SO easy to make! Just blend rolled oats, then mix in vegan protein powder, cashew butter, coconut oil, agave (or honey), strawberry powder (or powdered freeze dried strawberries), and strawberry extract (optional). 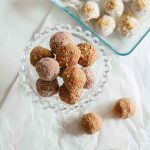 The yogurt + graham cracker topping really gives these no-bake energy bites that “cheesecake” flavor! It was my personal fave. I froze these after dipping them in the yogurt and sprinkling them with graham crackers so that the yogurt would harden, then let them thaw just a little bit before eating/serving. The only downside is that if you let them thaw for too long, the yogurt will definitely go back to being yogurt. Even so, they’re still DELISH! These Strawberry Cheesecake No-Bake Energy Bites can last about 2 weeks in the refrigerator! But let’s be honest. They will definitely be devoured before then! TBH, I have to hold myself back from basically eating them all. And sometimes I pretty much hold nothing back. We’re all about real talk here, right? Blend the rolled oats into a powder. In a mixing bowl, mix the rolled oats with the protein powder, cashew butter, coconut oil, agave, powdered freeze dried strawberries, and optional strawberry extract. Once everything is thoroughly mixed, place in the refrigerator for 5 minutes. Remove the refrigerated "dough" and roll into about 2" sized balls. Roll each energy bite in the desired topping, place in a container, and refrigerate until you are ready to serve. *Nutrition calculated for coconut shavings topping. 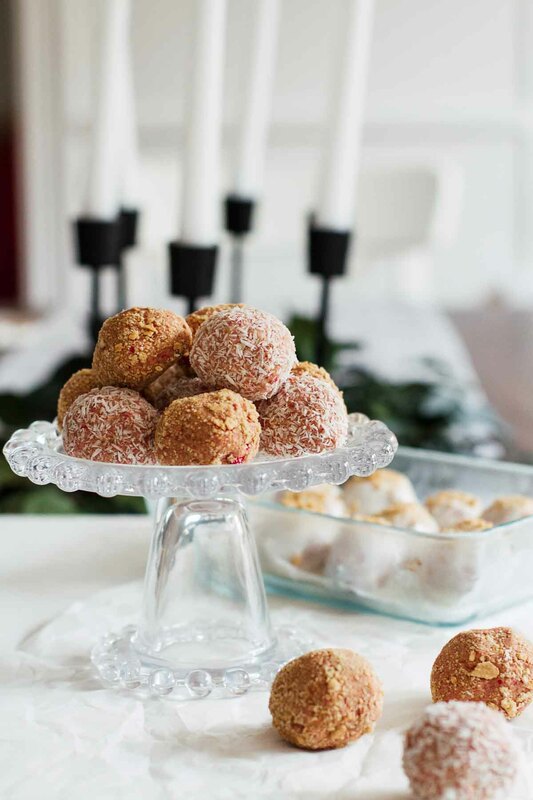 Love easy recipes like these Strawberry Cheesecake No-Bake Energy Bites? Be sure to check out A Month Of Healthy Eats For The Busy Girl! Ummm these sounds incredible!! They would be the perfect little pre-workout snack for me! Wow, these look delicious! I love a good energy bite and this vegan version is perfect for plant-based eaters. Delicious! I don’t know why I’ve never made energy bars before! I love how they’re so versatile, and they look delicious. Perfect for after a good workout.